How becomes Our Lady of Guadalupe Shrine. On October 12, 1990, as the result of a diocesan planning effort it was announced that the Our Lady of Guadalupe Parish would be consolidated with Sacred Heart Parish. The parish site would be that of Sacred Heart but a new parish would be formed with a new name. Thus Our Lady of Guadalupe Church at 901 Avenida Cesar E. Chavez would be closed February 1991. 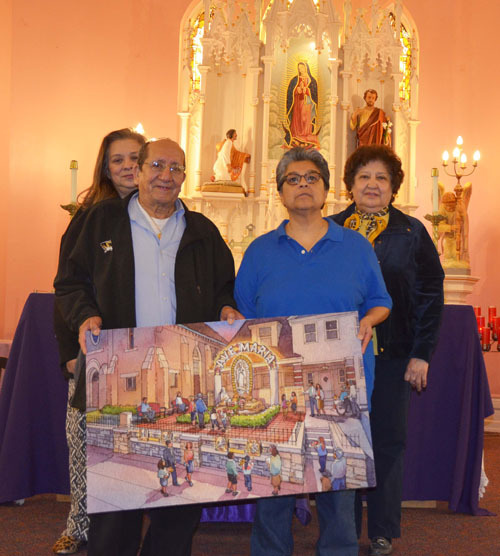 Supporters of Our Lady of Guadalupe Church formed Our Lady of Guadalupe Shrine Assoc. Inc., under the guidance of Ramona Arroyo, Teresa Sauceda and George Morales. The main objective of the organization was to maintain and support Our Lady of Guadalupe Church. A proposal was created asking John J. Sullivan, Bishop of the Kansas City/St. Joseph Diocese, to preserve the Church as a Shrine to Our Lady of Guadalupe. The Bishop approved the proposal and the Shrine was leased to the Association. There are four stainglass windows in the Shrine that depict the apparations of Our Lady of Guadalupe that occurred on the hill of Tepeyac, Mexico. The picture in the center alter of the Shrine was painted by a local artist. This Shrine represents the struggle of the Mexican people coming to this country and their devotion to Our Lady of Guadalupe. ﻿“La Colonia” of the Westside began to form in 1910 around 23rd and Madison. In that decade many came here to find jobs on the railroads and in the packing houses and many of them had already been working on the Santa Fe railroad in the southwestern United States, so their movement here was natural. Thomas Purcell, in his “Memoirs” states that the largest settlement was “in the neighborhood of Southwest Boulevard, north of the terminal tracks between Summit Street and the State Line.” Mexican nationals of course, had been part of the Jackson County scene since the day of the Santa Fe trail. Judith Laird in a study entitled “Argentine, Kansas: The Evolution of a Mexican-American Community,” states that when the United States government decided to exclude Chinese and Japanese laborers from entering the U.S. to work on the railroads, in the construction trades and in agricultural, everyone turned to Mexico since there was no restriction on the entrance of persons from Mexico at the time. 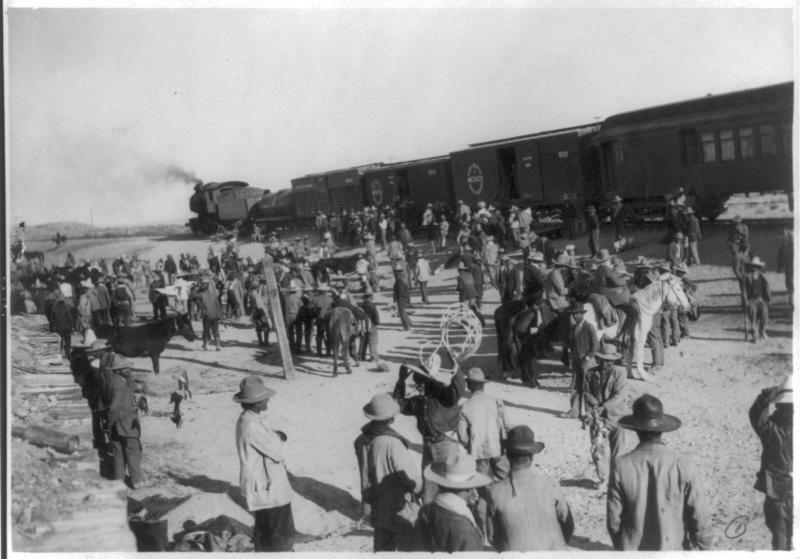 The Santa Fe railroad and the Southern Pacific were active in building railroads in the southwest in the late 1800s and in 1900 they began to actively recruit Mexicans at El Paso to enter the U.S. to work on the railroads. A second group to leave Mexico for the U.S. and the Kansas City area were those who were displaced by the Mexican Revolution in 1910. Ms. Laird states that a refugee community lived in Kansas City for the duration of the revolution. In the aftermath of the revolution Catholics were persecuted severely especially religious and clergy. Hundreds of them were murdered or forced to flee for their lives. Many came to the United States where they were received with open arms for their desire to minister to other Catholics who likewise had fled. 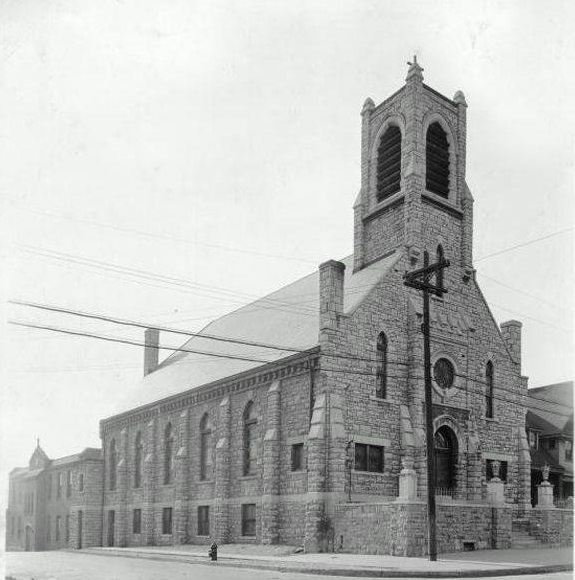 The parish begun in the spring of 1914. Fr. Jose Munoz and Fr. Arilo Corbato, a Carmelite, had been driven from Mexico by the 1910 revolution and had come to Kansas City as refugees. They arrived here on June 12, 1914. However, in the previous year a Fr. Ocampo came to the city. He served the Mexican community which gathered for Mass at Sacred Heart church. Shortly after Fr. Munoz came Fr. Ocampo left. The priests appeared to be suffering from malnutrition. They literally did not have enough clothes to cover their backs. And they had no money. They were poorer than the proverbial church mouse but not worse off than many of the people they wound up serving. Perhaps it is understandable that a certain legendary quality has come to be attached to them especially Fr. Munoz. Sacred Heart Church for use of the church; about 20 families soon gathered for Sunday Mass. With Purcell’s assistance the Catholic Club and the Mexican community were introduced and formed the beginning of a long and fruitful mutual relationship. With the Club’s help a residence was leased at 2341 Holly Street(Purcell says it was on Jefferson Street). The downstairs was fixed up as a chapel and the priests were able to live upstairs. During the first year the Catholic club paid the rent on the building, and supplied money for the priests’ living expenses. (There are different versions of the sequence of events here and who was involved). On November 15, 1914 a chapel in the home was blessed. Fr. Edmund Griffin at St. John the Baptist parish donated an altar and the Tabernacle Society donated a chalice and vestments. 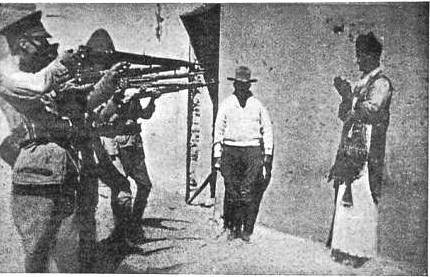 Observers were astonished that the Mexican custom upon entering the church was to drop to the knees and continue on the knees until reaching the place in church they planned to occupy. The Mexicans did not use pews or chairs.) They were again astonished to witness that those receiving Communion also approached that altar rail on their knees. The Mexicans explained the customs as indicating a great humility before the presence of God. The ceiling in the chapel was so low that Bishop Lillis who was a tall man, could not wear his mitre for the blessing. Within five months over 200 people were coming to Mass and soon this building proved to be to small to accommodate the congregation, for once the location of the place of worship was fixed, Spanish speaking began to relocate from all over the city to the Westside. The congregation stayed at this location for about 18 months. During this time Father Cyril moved on to Osawatomie to work with immigrants there. Later he would go to Arkansas to head a Carmelite school. 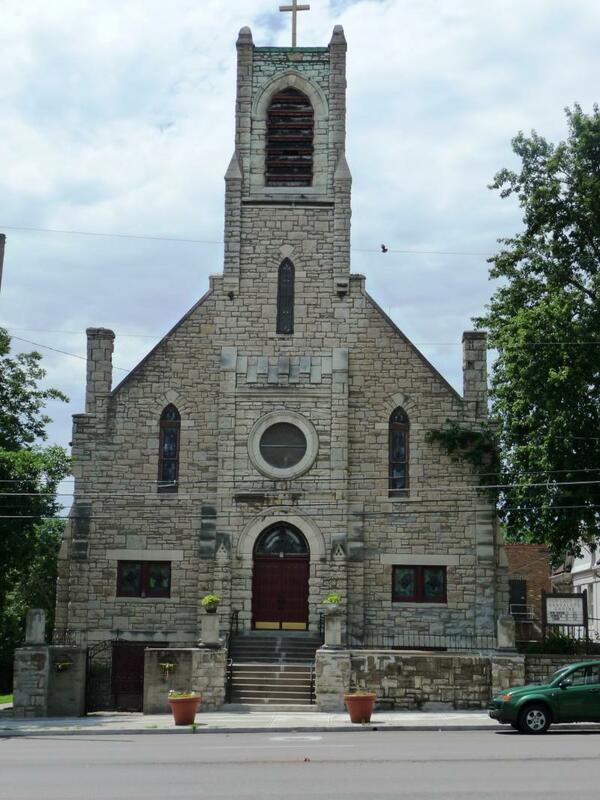 The next location for the gathering of the congregation was a store room at 1120 W. 24th Street, rented in 1915 with the help of Sacred Heart parishioners. Apparently Father Munoz moved here. It is said that his room cost $10 per month to rent. Soon attendance had reached 500 people on Sunday. About one third of those attending had to stand outside. Fr. Munoz was the only Spanish speaking priest for the entire area. Sometimes sick calls would take him 60 miles out of the city. He would baptize over 300 a year and witness 50-60 marriages. 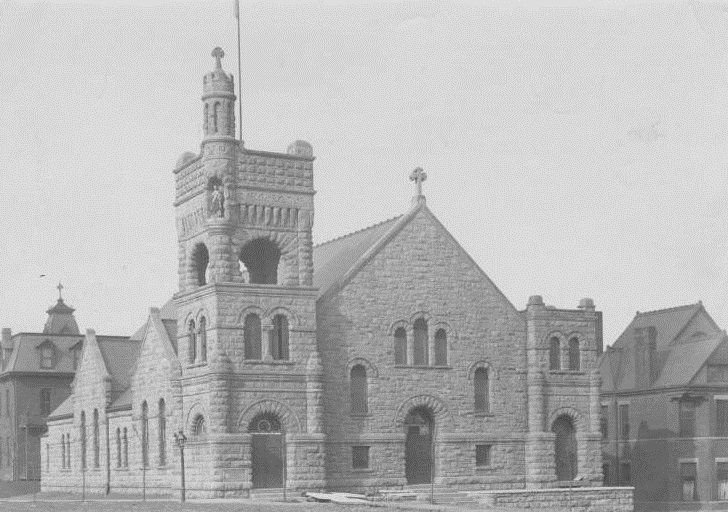 The parish records show that he ministered as far west as Salina and Concordia, KS. Intense pressures were brought to bear on the immigrants to join other religions. Several Protestant missions were established in the neighborhood. In the meantime the Swedish Evangelical Lutheran Emanuel church property at 23rd Street and Madison came on the market. At first the owners wanted $65,000, which was actually a reasonable sum given the fact that the stone structure with slate roof had cost $100,000 to build. However, after several years of negotiations the church and pastors house were purchased for $18,000. Everyone was stunned that the Lutherans who had moved to Westport, were willing to let the church to so cheaply. The warranty deed was signed on September 11, 1919, and states that the sum of money agreed upon was $18,000. Victor Spong was the President of the church and Olof Mattson, Oscar Magnuson, Arthur Johnson, Arthur Ryden, Gus Johnson and August Sjoholm were the trustees of the church. “The Rev.Dr.Spong was still after me but we could do nothing. One day he phones to say he was bringing his trustees to my office to discuss the buying of the church. I was embarrassed as I had no means of getting any funds for the purpose and made up my mind to tell him, finally, there was no use, we just could not buy it. “The committee and Dr. Spong came, telling me they had decided to bring the price down to forty-five thousand dollars (a bargain at that price) but again I told them it was out of the question. 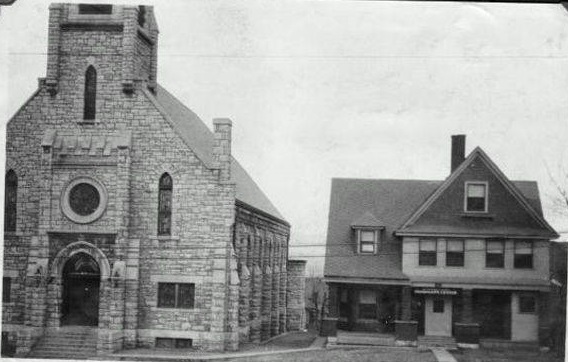 “They left in a huff but in about a half an hour Dr. Spong returned to say he had notified the trustees of his intent to leave Kansas City unless this property were sold and another church built out in south Kansas City where the Swedish people had moved. “The committee came to offer to take twenty-five thousand dollars. I explained that I could do nothing. Finally they asked me to make an offer. To get rid of them I offered ten thousand dollars. They jumped up and walker out of the office. Dr. Spong with them. In half an hour they were back, saying they knew I would do better than make that ridiculous offer. They haggled and I finally compromised on eighteen thousand five hundred dollars. We drew up a contract. I paid one hundred dollars to bind the bargain. Through Purcell’s efforts the Catholic Church Extension Society contributed $500 toward the purchase price of the church. This is most likely the first project the Extension Society funded in the diocese. Before Sacred Heart parish church was built Bishop Hogan had investigated the purchase of the church for that congregation but the cost was prohibitive. The only physical change to the building was the removal of a picture of Martin Luther from one of the stained glass windows and the addition of an altar. The church could hold about 400 although a capacity up to 900 is cited. There was a basement in the church which had been fixed up as parish hall with stage and kitchen. Plans were to move the school immediately to the basement and then to the parish house as soon as the occupant had vacated the premises. On October 5, 1919, the church was formally opened for Catholic worship. At the service each person present brought a candle as was the Mexican custom. It is said that some were as large as three to five feet in length. Fathers Madrigal ( of St. Joseph hospital) and Roscombo ( of Topeka) assisted Fr. Munoz at the dedication. The Redemptorist Fathers donated the main altar. The K of C purchased the carpet for the church. The German-speaking people at Sts. Peter and Paul and Father Zechenter were generous friends and benefactors of the new parish and remained so through the years. However, it was especially the people of the parish who pledged and gave the money to pay the debt on the church, along with help from their friends from time to time. The people of the parish were very poor. Even a small contribution required tremendous sacrifice. William Lona recounted that the problems with acquiring the property were not finished. At the time of purchase the city was planning to cut 23rd Street through making it a trafficway to connect with Kansas City, KS., by the way of a new viaduct. The church had a 105’ frontage which would cost the congregation dearly in assessments. However, there was a Judge Miles Bulger who had grown up on the West Side and knew the property of the area. His mother lived less than a block from the church. When the judge was a member of the City Council he had an ordinance passed which exempted the people living from Summit to Drips Streets from having to pay taxes on the widening and paving of streets, and the installation of sidewalks, water lines and sewers. The church was saved yet again. The Fiesta has been held at various sites around the city, from 23rd and Jarboe to Crown Center to the Downtown Airport. However, the focus has always been the same: to provide for the financial needs of the parish or the school. It might be noted as well that the entertainments are typically presented by the people themselves who have made a determined effort to preserve the dances and music from the states and cities their ancestors left in Mexico to come to Kansas City. The Augustinians were there for two years and they departed. Apparently they did not wish to be burdened with a school or to pay the interest on the $10,000 remaining for the purchase price of the Church. After the Augustinians left in 1928, Fr. Bernard Hale, director of Catholic Charities took over the parish. In June 1929, the Franciscan Fathers took over, and they would remain until 1943. This arrangement was negotiated in the train station in St. Louis by Bishop Lillis with the Franciscan Provincial, Fr. Urban Fruendt, OFM, sometime around November 1, 1928. Fr. Toribius Christmann, OFM, was pastor, followed by Frs. Fabian Hoerner Paulinus Kranz, Flavin Maltaner (associate), Ubald Schwetschenau, Felix Marsinko and Eugene Russeau. In September 1931, a Boy Scout Troop was formed in the parish with Pat Waters as scout master. The Troop was re-chartered on July 12, 1982, as Boy Scout Troop 106. In 1934, there were 291 families with a total of 1376 individuals. Of these 419 were of grade school age and 27 were in high school or college. In 1959 there were 992 children in the parish, 462 of whom were of grade school age, and 141 of high school and college age. There were 1045 adult individuals. In 1940, when study clubs were a major movement in the entire Diocese the parish had the largest single study club with 75 members. The Catholic Youth Organization of the parish fielded a team who became Senior City and Divisional basketball champions of 1941. They were: Max Arreguin, Fi Hernandez, Pete Hernandez, Lalo Nieto, Ray Rodriguez, Al Tamayo, Amado Tamayo, and Mel Bergman, coach. Elected officers of El Centro Catolico, the oldest men’s organization in the parish in 1941 were: Manuel Lopez, president; Leonardo Herrera, vice-president; Meliton Gutierrez, secretary and Jose Rodriguez, treasurer. In honor of the event Dolores Gomez and Maria Aredondo arranged for an entertainment. In 1943, the Augustinians returned to the parish, this time with Fr. Cuartero as pastor and Fr. Gerard LaMountain a native of Kansas City as associate. Other priests have been: Damian Gobeo, Jose Maria Santiago, Roman Iribarren, Xavier Losacros, associates. Jose Urrutia, Christopher Belber, Etelvino Iglesias, Anthony Palos, Gabino Perez, Albert Pelt, Augustine Morales, and Clarence Krajicek. A 1950s sociological study one of the population of Kansas City found that the Mexican-Americans had adjusted well to urban living but were not financially well off. Language was a major handicap. 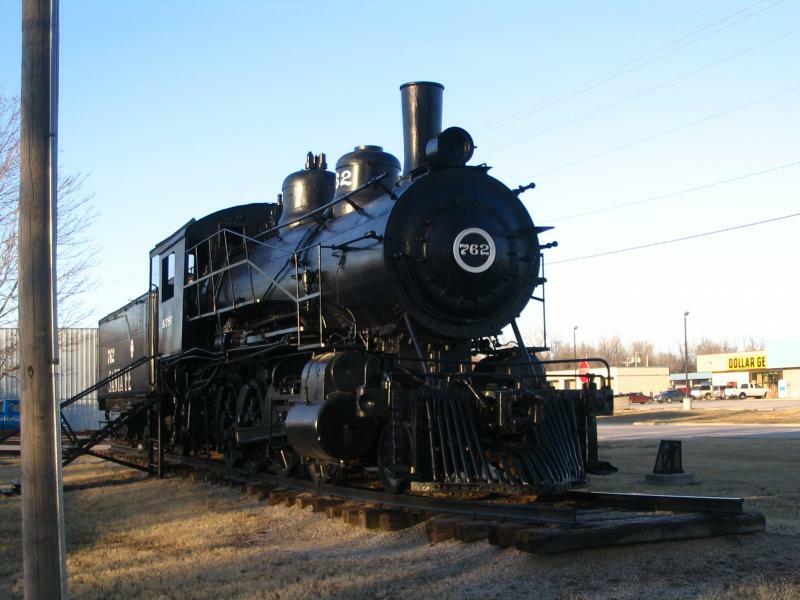 The men worked on the railroads, in the packing plants and in factories. Few of the women worked outside the home. Family incomes were rarely over $3600. Families typically had four to six children. The people had a strong sense of community, which was nurtured by the local parish church. Parish histories seem to consider the period of 1948-1951 a golden age in the spiritual and temporal life of the parish. This was the pastorate of Fr. Damian Gobeo. The flood of 1951 devasted the west bottoms. Every member of the parish joined in the effort to give shelter to more than 1500 people displaced by the flood. Matilda Bolanos, for Filiberto Bolanos; Elena Cano, for Filomeno Cano; Family of Alberto Valdivia; Cecilia Juarez, for Pablo Juarez; Andrea Lopez, for Ricardo Lopez; Isaura Mendoza, for Manuel Mendoza; Julia Merino, for Jesus Merino; Inocencia Morales, for Carlos Morales; Maria Orezco, for Teodoro Orezco; Concha Rodrigues, for Francisco Rodriguez; Maria Sifuentes, for Ralph Sifuentes; Consuelo Valenciano, sister-in-law of Louis Valenciano. Prior to this the boundaries were: 18th Street on the north, Main Street on the east, the Railroad Tracks on the south (24th Street) and State Line on the west. (Fr. Urrutia, ORSA, to Father Koenig, 3 July 1958). In the spring of 1959, the West Pennway Plaza housing project was built. It cost $3,571,575 and could house 250 families in 25 buildings. In February 1967, Santos Madrigal and Raphael Zapien headed up a committee to raise the income of the parish. Those attending the first Spanish Cursillo (March 1980) from Our Lady of Guadalupe parish were Epifanio Vaca and Serafin Lopez. Lorenzo Lopez attended from Sacred Heart parish. In the Summer of 1973, the stained glass windows were repaired by Hopcroft Art & Stained Glass Works for $2723. In June 1979, the parish was given into the hands of Fr. Edward Wagner and Fr. Charles Tobin, diocesan priests who had served in the diocesan parishes in Bolivia. Later Fr. Robert Crider, also a diocesan priest who spent time in South America, became pastor. On October 12, 1990, as the result of a diocesan planning effort it was announced that the parish would be consolidated with Sacred Heart Parish. The parish site would be that of Sacred Heart but a new parish would be formed with a new name. 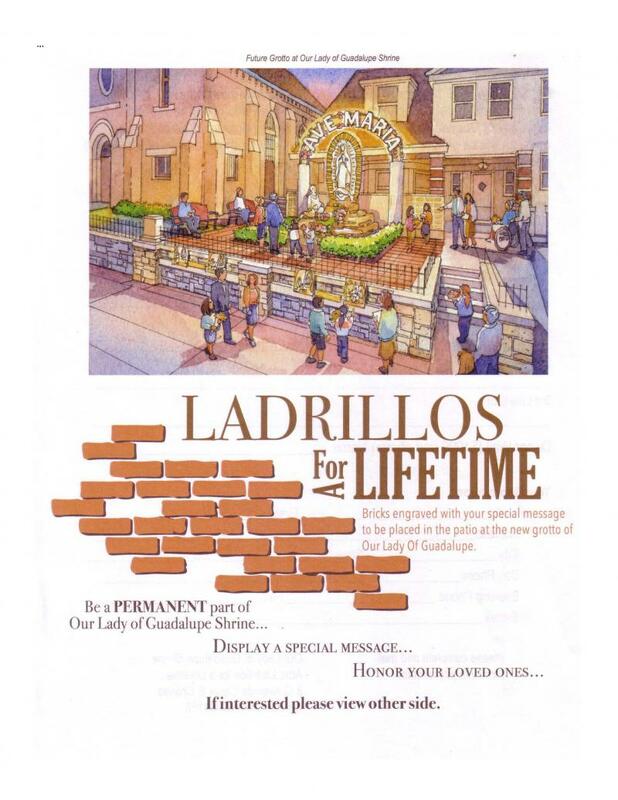 It was announced on January 13, 1991, that the name of the new parish would be Our Lady of Guadalupe as that was the wish of the majority of the parishioners. In September 1992, this name would also be used for the school. Later the name of the parish was changed to Sacred Heart-Guadalupe.